London Hotels, Guest houses and bed & breakfast in around near Leicester Square all with real-time, confirmed online reservations. Leicester Square is the centre of London's cinema land. UK film premieres are typically hosted at one of the four cinemas located directly within the square. In the center of the the Square is a copy of the Shakespeare memorial in Westminster Abbey. Busts of Sir Isaac Newton, Joshua Reynolds and William Hogarth including a modern statue of Charlie Chaplin. The Kingsley a Thistle Hotel Hotel is just a short walk from Convent Garden, the many delights of London lie on the doorstep: the excitement of Piccadily's Theatreland, world-class shopping down Oxford Street, an invigorating stroll through Hyde Park, the British Museum and other renowned attractions. Endless possibilities await guests of The Kingsley a Thistle Hotel . Tucked away in a small street just off bustling Leicester Square, you'll enjoy the attention of our friendly staff at this intimate and comfortable 58 room hotel. 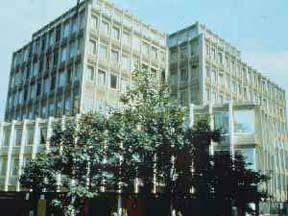 A modern hotel set in a superb and quiet location, in the cultural and geographical heart of London. 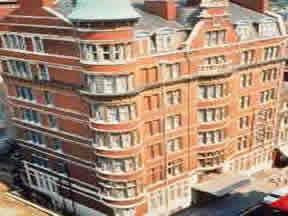 This 116-room hotel, including 80 air conditioned rooms, boasts the Savoria Brasserie and the Battle of Trafalgar pub. 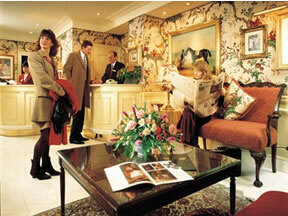 This small and friendly Victorian hotel is suited to both business and leisure travellers. 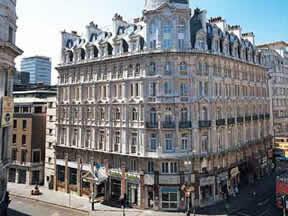 Located between Leicester Square and Piccadilly, a myriad of London attractions are nearby.